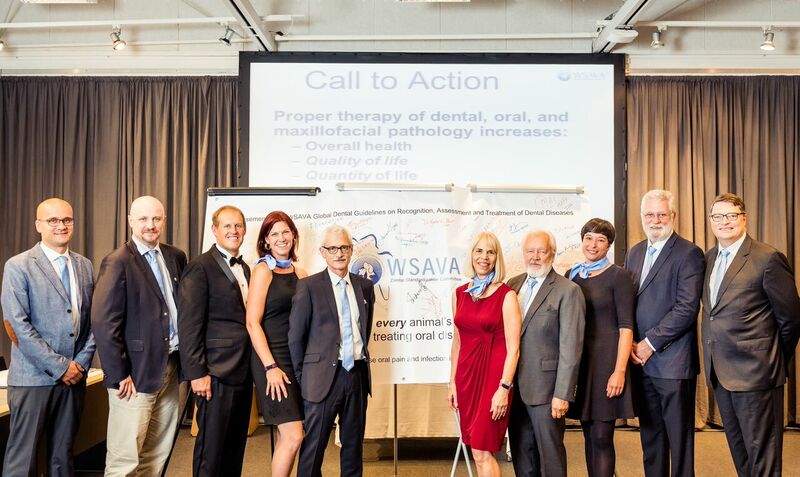 (Left to right): Members of the WSAVA Dental Guidelines Committee during the launch: Paulo Steagall, Jerzy Gawor, Brook Niemiec, Kymberley Stewart, Gottfried Morgenegg, Marge Chandler, Rod Jouppi, Ana Nemic, Cedric Tutt and David Clarke. Periodontal disease is the number one health problem in companion animals. By two years of age, around 70 per cent of cats and 80 per cent of dogs have some form of it, with small and toy breed dogs particularly susceptible. Yet the standard of care is variable. Additionally, there has been a movement to push anaesthesia-free dentistry. Untreated and undertreated dental disease is a significant animal welfare concern, due to the pain it causes. There are also local health consequences like oronasal fistulas, pathologic fractures of teeth and/or jaws, bone infection, eye infection and blindness, and systemic disease including kidney, liver and cardiovascular disease. There is some evidence that periodontal disease is associated with an increased risk of oral tumours. The World Small Animal Veterinary Association released dental guidelines just last week, available to all veterinarians around the globe. Importantly, they stress the need for veterinarians to improve dentistry skills and they “strongly reject” anaesthesia-free dentistry. PLEASE NOTE: before you print these out, the PDF is 161 pages in total. It contains a number of diagrams, photographs and illustrations. Each section is quite extensively referenced so although it’s a sizeable read it isn’t quite as big as it looks. The “Guidelines” are more than just guidelines – they’re a substantial, well-referenced handbook providing information on veterinary dentistry and pathology, interpretation of dental radiographs, a dental scoring system, and best practice recommendations. Evidence-based guidance on periodontal therapy, radiology and dental extractions is also included, together with details of minimum equipment recommendations. It also includes information on home dental care and nutrition. Anaesthesia-free dentistry is rejected as it is described as “ineffective at best and damaging at worst” and a cause of unnecessary stress and suffering to patients. The corollary of this is that is it is impossible to perform a complete dental examination without general anaesthesia – as there may be no or very subtle signs of dental disease. The risks and benefits need to be weighed up in each individual case. The Guidelines address the question of whether sedation is an appropriate halfway point – but they state that it is “not always safer than general anaesthesia” and does not facilitate airway protection, appropriate ventilation and monitoring of cardiovascular function. The Guidelines were developed by WSAVA’s Global Dental Guidelines Committee (DGC), comprising veterinary dentists from five continents as well as contributors from the WSAVA Global Pain Council, Global Nutrition and Animal Wellness and Welfare Committees. The aim is to ensure the guidelines are helpful to every veterinarian, whether in an advanced hospital setting or a context where companion animal practice is still developing. Not every practice has all the equipment mentioned, but there are alternatives suggested where available. The Guidelines can be downloaded for free at http://www.wsava.org/guidelines/global-dental-guidelines. Their development was sponsored by Addison Biological Laboratory, Boehringer Ingelheim, Hill’s Pet Nutrition, KRUUSE and Virbac, however no specific brands are mentioned within the guidelines.